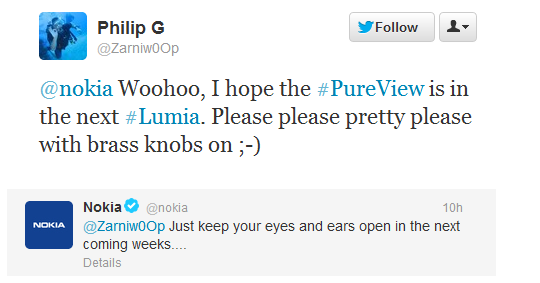 Nokia teases PureView for Windows Phone but what would it look like? It’s a big question whether or not Nokia’s upcoming lineup will feature any PureView technology in it. While it’s nice to dream of a 41MP camera alongside Windows Phone 8, we’re holding down our excitement until we learn more because so far we have seen little to make us believe otherwise. That certainly seems like a reference to the joint Microsoft announcement that Nokia is hosting in a few weeks here in New York. From our own sources, we’ve been leaning towards no PureView device this time but instead slightly further down the road, as Nokia plans to release numerous Windows Phones over the next year. With Nokia’s tweet though, we could be looking at something sooner. But the question for us is What is PureView exactly? “At its default 5MP setting, every pixel in the finished image corresponds to about eight pixels on the sensor. This oversampling helps reduce noise, increase color accuracy, and increase sharpness… oversampling reduces the softening effects of the Bayer filter, the anti-aliasing filter, and diffraction of the tiny lens, resulting in sharper images. In other words, a PureView Windows Phone would not necessarily need a 41MP camera to have the same technology as found in the Nokia 808. That’s good news because as far as we know, Windows Phone 8 devices will be primarily using Qualcomm’s S4 chipset. So what would that mean for Apollo? As far as we can tell, 20MP is about as high as we can expect for a Nokia PureView camera phone running Windows Phone 8—at least during this first release. The Nokia 808, on the other hand, sports a 1.3 GHz ARM 11 CPU with a Broadcom BCM2763 multi-media processor. It also runs the Qualcomm S2 (MSM8255) chipset for the radio but evidently the camera functions are bypassed for the more capable Broadcom chipset. That adds both cost and size to the device as opposed to the more economical single system on chip (SoC) S2 or S4 option. That is the point of SoC after all, to have the entire chipset on one board with features enabled or disabled based on the OEM’s need. We can’t say for certain if those latter 808 technologies have been adopted for Windows Phone 8 but we have not seen any indication that they have just yet. Meanwhile, Qualcomm is boasting about their S4 support, which we imagine most OEMs will be using for their Windows Phone 8 series of devices. A full-on PureView Windows Phone with the 808 technology on board plus the more advanced S4 Qualcomm chipset for dual-core CPU support, LTE, etc. This will be more costly and result in a larger device due to the extra chipset needed to power the camera. A reduced PureView device running just the Qualcomm S4 with a maxed-out 20MP camera plus the PureView software enhancement of image oversampling. Although we’re just going on pure guess work here, if we had to place bets it would be on the latter—a reduced MP camera in a device that still retains the core of the PureView technology. That would allow Nokia to keep costs down, maintain ease in mass production and keep the proposed device relatively thin. But then again, when Nokia introduced the PureView 808 with a 41MP camera back months ago, the room was filled with press and fans who literally gasped when it was revealed. That means Nokia has a lot of tricks up their sleeve and it’s still too early to predict what they plan to reveal.